The Chief of Civil/Military Affairs, Army HQ, Brig. Gen. Nicholas Rogers says territories held by the insurgents have been liberated as the people are returning back to their communities gradually. 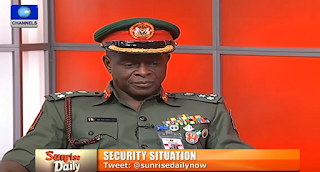 Rogers was the guest of Channels Television’s Sunrise Daily on Thursday, December 10, where he gave an update on the progress made by the Nigerian military in its fight against terrorism in the Northeast. “What is left are some villages between the boundaries of Nigeria, Chad and Cameroun particularly along the Lake Chad region,” he said. Brig. Gen. Rogers said that stability and calm have returned in Maiduguri, Damaturu, Gwoza, Bama, Baga, Monguno and other towns, adding that some buildings like schools, churches that were burnt down are being rebuilt by the military. He, however, noted that there are some challenges along the line. According to the Brig. Gen, in continuing the fight against the insurgents and protecting the towns that have been liberated, other security agencies are yet to get fully involved and this situation has been preventing the military from carrying out their full operations. Brig. Gen. Rogers also disclosed that several meetings have been held and is still ongoing to discuss the challenges in the force but noted that the responses have been slow.